Colonial waterbirds have impacted forested island ecosystems throughout their breeding range, changing vegetation, and soil characteristics and bird communities.Our objectives were to (1) determine effects of three levels of colonial waterbird exclusion on overall vegetation diversity and growth, and survival of a candidate restoration species (black elderberry; Sambucus nigra canadensis); (2) investigate effects of different planting techniques on survival and growth of black elderberry; and (3) determine effects of waterbird colonization on soil chemistry. In 2012, we investigated effects of three levels of waterbird exclusion (none control plots [CON]; partial, which excluded waterbirds larger than gulls [PEX]; and full which excluded all waterbirds [FEX]) on bird use, existing vegetation growth and diversity, and survival of planted black elderberry on three islands in Door County, WI, LakeMichigan. In 2013, we evaluated survival of black elderberry established with four planting treatments within three waterbird exclusion treatments on two islands in 2013.We also compared soil chemistry characteristics between islands with and without nestingwaterbirds for 2 years. Overall plant growthwas greater in exclosures, but elderberry survival was similar among treatments. Soil replacement and weed suppression planting treatments did not affect survival, but generally increased overall elderberry biomass. Soil from nesting islands was more acidic and had greater nutrient concentrations than reference islands. 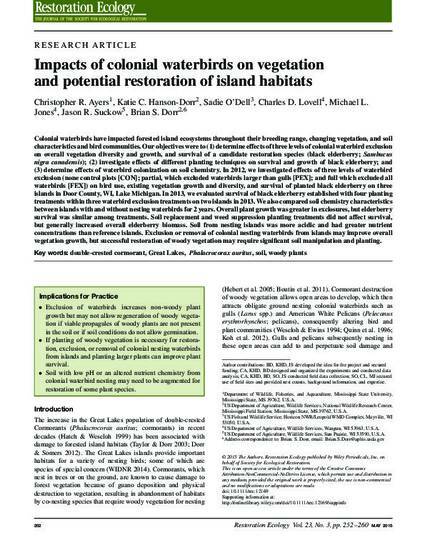 Exclusion or removal of colonial nesting waterbirds from islands may improve overall vegetation growth, but successful restoration of woody vegetation may require significant soil manipulation and planting.